Comments: Apprentice to the Sith Lord Darth Sidious, Darth Maul has undergone years of demanding and brutal training to become an incredible warrior for the Sith. After expertly wielding his lightsaber to prove his skill, he bows respectfully before his master. 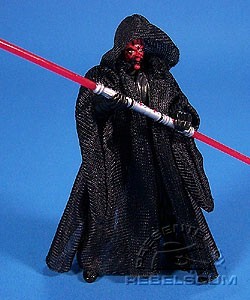 Darth Maul is a repack of the figure from 1999's Episode I Sith Speeder and Darth Maul. This figure is a great pilot figure for the Sith Infiltrator.